A patient with agranulocytosis induced by vinpocetine is presented. Agranulocytosis was detected after vinpocetine therapy was started, and did not occure during a two year follow up without vinpocetine. Granulocyte-colony stimulating factor (G-CSF) therapy is recommended for the early recovery of agranulocytosis. Bone marrow aspiration biopsy showed remarkable reduction in the number of myelocytic cell types as well as erythroblasts, suggesting that a toxic, but not an immune, mechanism is involved in the pathogenesis of vinpocetine-induced agranulocytosis. Drug-induced agranulocytosis is a life-threatening disorder that leads to a selective profound granulocytopenia. Many drugs including neuroleptics (Lieberman et al, 1988), anti-thyroid medications (Meyer et al, 1994), analgesics, phenothiazine derivatives (Pisciotta, 1990) and anti-inflammatory drugs are known to induce agranulocytosis. Vinpocetine, ethyl(13aS, 13bS)-13a-ethyl-2,3,5,6,13a,13b-hexahydro-1H-indolo(3,2,1-de)pyrido-(3,2,1-ij)(1,5)naphthyridine-12-carboxylate, which was synthesized in 1984, is used for patients with cerebral circulatory diseases as a cerebral vasodilator. It has the property of reducing cerebral vascular tone while increasing total peripheral vascular resistance (Miyazaki, 1995). In human studies, it has been suggested that vinpocetine was reported to increase cerebral blood flow in previously ischaemic cerebral legions (Tamaki et al, 1985), to decrease platelet aggregability, in patients after transient ischaemic attack or stroke and to increase erythrocyte deformability in patients after ischaemic stroke (Hayakawa 1992). In addition, it is known to facilitate the transmembrane glucose transport, resulting in increased glucose uptake and release, and thus the extraction of glucose, predominantly in brain tissue spared by stroke (Szakall et al, 1998). Vinpocetine has also been shown to block voltagegated Na+ channels in rat cortical neurons (Molner et al, 1995), helping to provide neuroprotective and anticonvulsant effects. Furthermore, vinpocetine is used as a cyclic nucleotide phosphodiesterase inhibitor (Fisher et al, 1998). Based on the results of pharmacologic studies and data from animal experiments, vinpocetine was recommended for use and has been administered to patients with stroke in several countries in Europe and in Japan (Bereczki et al, 1999). It is also useful for the management of patients with moderate organic psychosyndromes including primary dementia (Hindmarch et al, 1991). No fatal adverse effects have been reported so far linked to vinpocetine. We report a case of agranulocytosis that was associated with vinpocetine treatment. A 73-year-old Japanese man developed right hemiplegia and was admitted to an ambulatory care centre. He received drugs to stabilise his blood pressure and prevent atrial fibrillation. His previous history was otherwise unremarkable. His family history was noncontributory. On a cerebral computed tomogram taken 3 days after admission, a low density area was seen in the area of the left middle cerebral artery. A cerebral infarction was diagnosed. Treatment, including ticlodipine, which has well-known bone marrow depressing effect, was initiated, and the patient was transferred for rehabilitation approximately 2 months after the onset of cerebral infarction. The laboratory data on admission were normal except that lactate dehydrogenase was 489 IU/ l (normal range 180-450). The white blood cell (WBC) count was 8,800 mm-3 with 62% neutrophils. The patient's drug regimen for atrial fibrillation and hypertension had not changed. Various kinds of cerebral vasodilators and cerebral metabolism activators including propentofylline and indeloxazine hydrochloride were prescribed and sequelae and sensory aphasia improved. However, these drugs could not be continued because of adverse effects such as systemic skin eruption, inguinal erosion and hypereosinophilia. Vinpocetine (15 mg per day) was therefore prescribed. The WBC count tended to decrease within the normal range, but counts were only performed infrequently as the patient's condition was generally stable. Fifty days after the patients had begun taking vinpocetine, he experienced high fever without any other symptoms. The WBC count was then 600 mm-3 with no neutrophils. The administration of vinpocetine was discontinued, and granulocyte colony-stimulating factor (G-CSF) and the additional antibiotic/ antifungal drug therapy were started soon after hematological evaluation. The number of WBCs and neutrophils increased 10 days after G-CSF was administered. This therapy was terminated 12 days later when WBC count exceeded 10,000 mm-3. The WBC and neutrophil count remained within the normal range for two year's follow up without the additional administration of G-CSF, (other drugs including ticlodipine were also prescribed, suggesting that vinpocetine was the only drug which had cause the reversible agranulocytosis. The patient's clinical course is shown in Fig.1. 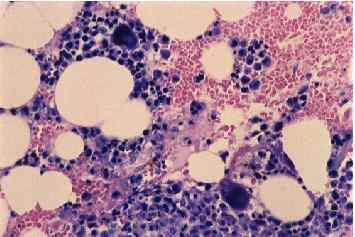 Bone marrow aspiration biopsy was performed when agranulocytosis was diagnosed, and severe bone marrow suppression (total cell counts 9,000 mm-3) was observed with the number of remarkable myelocytic reduction, as shown immediately below. Aspiration biopsy was performed again 7 days after G-CSF was prescribed. At that time, however, the number of WBCs in peripheral blood was still 2,200 mm-3 with 3% neutrophils. 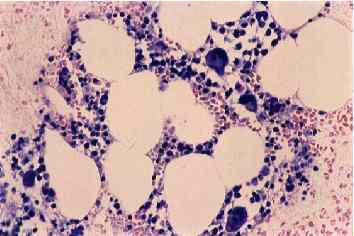 The total number of cells in bone marrow was still 45,500 mm-3, but myelocytic development was observed, as shown below. The components of bone marrow at day 0 and day 7 after G-CSF was initiated were shown in Table 1. Drug-induced agranulocytosis has been defined as a severe selective neutropenia due to an unpredictable adverse drug reaction (neutrophils < 200 ml-1). It is a serious disorder that is associated with a high risk of mortality due to life-threatening infection. A variety of drugs, including analgesics, anticonvulsants, antimicrobials and antithyroid drugs, have been associated with agranulocytosis (Heimpel, 1988). In this case, granulocytes were gradually reduced after the start of vinpocetine, and it did not continue without vinpocetine, suggesting that vinpocetine induced agranulocytosis. To our knowledge, this is the first report that either a cerebral vasodilator or cerebral metabolism activator can cause agranulocytosis. Toxic and immune mechanisms are suggested to underlie drug-induced agranulocytosis (Heimpel, 1988). The immune type is mediated by drug-induced autoantibodies or drug-dependent antibodies with rapid destruction of mature circulating granulocytes and hyperplastic bone marrow. With the toxic type, cell production in the proliferative compartments of the bone marrow is impaired. Direct toxicity to haematopoietic cells is suggested by the rather slow decline of the leukocytes. Toxicity is also not strictly limited to granulopoietic precursors, but may include transient hypoplasia of erythroblasts (and even megakaryocytes). Aspiration biopsy in this case showed a reduced number of myelocytic cell types as well as erythroblasts in the bone marrow, although erythrocytes were not decreased during clinical course probably because of longer peripheral life span, suggesting that toxicity of haemopoietic precursors may be the predominant cause of agranulocytosis in this case. It is also suggested that the development of totipotent stem cells are inhibited by vinpocetine, as not only myelocytic cell types but erythroblasts are reduced. The other explanation for this is that the recovery of WBC, myelocytic cell types and erythroblasts is slower than expected even with the induction of G-CSF (as shown below). It is generally thought that bone marrow suppression at the committed stem cell level or more subsequent stages is transient because undamaged uncommitted stem cells may feed into this system to initiate rapid recovery (Pisciotta, 1990). Megakaryocytes are intact in this case, but bone marrow suppression might develop into aplastic anemia when vinpocetine was continued. Although agranulocytosis related to vinpocetine was slow to develop in this case, frequent hematologic evaluation is recommended during treatment with cerebral vasodilators and cerebral metabolism activators. Although agranulocytosis is detected early and drug therapy is withdrawn, patients are vitally endangered by infectious diseases for a longer period of time until hematologic recovery. To lower the risk of severe infection, G-CSF administration is recommended in such cases (Demuynck et al, 1995). In the case reported here, though recovery was not rapid, G-CSF may help induce the recovery of myelocytic proliferation, subsequently the patient was rescued from severe infectious diseases. The lack of a suitable assay for predicting the occurrence of drug-induced agranulocytosis mandates the need for monitoring for this adverse effect. Bereczki, D, Fekete, I. (1999) A systematic review of vinpocetine therapy in acute ischaemic stroke. Europian Journal of Clinical Pharmacology. 55, 349-52. Demuynck, H, Zachee, P, Verhoef, G E, Schetz, M, Van den Berghe, G, Lauwers, P, Boogaerts, M A. (1995) Risks of rhG-CSF treatment in drug-induced agranulocytosis. Annals of Hematology. 70,143-7. Fisher, D A, Smith, J F, Pillar, J S, Cheng, J B. (1998) Isolation and characterization of PDE9A, a novel human cGMP-specific phosphodiesterase. Journal of Biological Chemistry. 273,15559-64. Hayakawa, M. (1992) Effect of vinpocetine on red blood cell deformability in vivo measured by a new centrifugation method. Arzneimittelforschung. 42,281-3. Heimpel, H. (1988) Drug-induced agranulocytosis. Medical Toxicology. 3, 449-62. Hindmarch, I, Fuchs, H H, Erzigkeit, H. (1991) Efficacy and tolerance of vinpocetine in ambulant patients suffering from mild to moderate organic psychosyndromes. International Clinical Psychopharmacology. 6, 31-43. Lieberman, J A, Johns, C A, Kane, J M, Rai, K, Pisciotta, A V, Saltz, B L, Howard, A. (1988) Clozapine-induced agranulocytosis: non-cross-reactivity with other psychotropic drugs. Journal of Clinical Psychiatry. 49,271-7. Meyer-Gebner M, Benker, G, Lederbogen, S, Olbricht, T, Reinwein, D. (1994) Antithyroid drug-induced agranulocytosis: clinical experience with ten patients treated at one institution and review of the literature. Journal of Endocrinological Investigation. 17, 29-36. Miyazaki, M. (1995) The effect of a cerebral vasodilator, vinpocetine, on cerebral vascular resistance evaluated by the Doppler ultrasonic technique in patients with cerebrovascular diseases. Angiology. 46, 53-8. Molner, P, Erdy, S L. (1995) Vinpocetine is as potent as phenytoin to block voltage- gated Na+ channels in rat cortical neurons. Europian Journal of Pharmacology. 273, 303-6. Pisciotta, A V. (1990) Drug-induced agranulocytosis. Peripheral destruction of polymorphonuclear leukocytes and their marrow precursors. Blood Reviews. 4, 226-37. Szakall, S, Boros, I, Balkay, L, Emri, M, Fekete, I, Kerenyi, L, Lehel, S, Morien, T, Molner, T, Varga, J, Galuska, L, Tron, L, Bereczki, D, Csiba, L, Gulyes, B. (1998) Cerebral effects of a single dose of intravenous vinpocetine in chronic stroke patients: a PET study. Journal of Neuroimaging. 8, 197-204.